Audion 300B SET Mono Blocks. Golden Night Reference Level. Hard Wired. This Audion amplifier is a self cancelling single ended 300B mono-block that forms part of our High End line-up of power amplifiers, It uses 300B tubes for the output. It's hand built and hard wired using solid silver 5 *9’s in all of the audio path.. The amp is auto biased. It will take almost any 300B (it comes with JJ tubes) and delivers a conservative 10 CLEAN watts into 8 ohms. Therefore, it has the power of competitors boasting 18-20W. OK, what in the heck is self-cancelling and why is it so important? It utilizes two voltage gain stages to produce a high dynamic driver circuit that itself drives the self cancelling single ended output stage that operates with auto bias.. A lot of the work of self-cancellation is done within specially wound output transformers. The effect is basically phase cancelation which enables better frequency response and the 300B tube to be driven better. 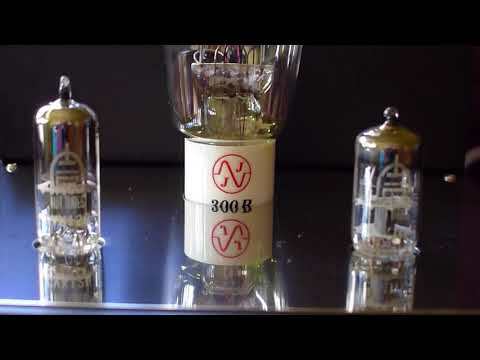 Audion Golden Night 300B self-cancelling single-ended 300B is a triode based mono-block amp uses no (zero) feedback in the design. It can also be made with PX25 (11 Watts) or 2A3 tubes (7 Watts) upon request. Wherever possible the components are sourced from Europe and the USA avoiding inferior Chinese components. This Audion amp is best suited for use with loudspeakers of 90db or better efficiency. The amps deliver 10 watts into 8 ohms from a 300B. A volume control on the front and mono inputs on the rear means that a pre-amp is not necessary, but is advised. The Audion Golden Night 300B Class A power amplifier has 8 ohm outputs and mono inputs. This has both 4 and 8 ohm outputs. It can be built with 8 and 16 Ohm taps at no extra cost. The Audion Golden Night being silver wired with a large polyprop power supply is able to retrieve great musical detail and nuances, far in excess of the Silver Night range.